“Sparky Dancers” was designed and created for my mother, Frances “Sparky” Sotcher, who taught me to embroider when I was 9 years old, and has always supported my pursuit of artistic endeavors. I wanted to show my gratitude with a piece just for her, and we discussed the works of several of her favorite artists, such as M.C.Escher, or possibly a reproduction of a meaningful photograph. One of her greatest joys in life is dancing, especially ethnic and traditional group dance styles, and her nickname comes from her vivacious, spunky dancing style. During a family road trip together exploring Route 66 as far as the eastern edge of Arizona, I suggested combining the celtic knot style of interweaving line drawing with the form of dancers in a ring, and sketched out the rough design, which she loved! Each man is wearing a different style of hat, and the dancers’ faces naturally developed individual personalities. The hearts and musical notes are worked into the design between the couples, and the darker black in the center and surrounding the figures is made up of overlapping black stars. 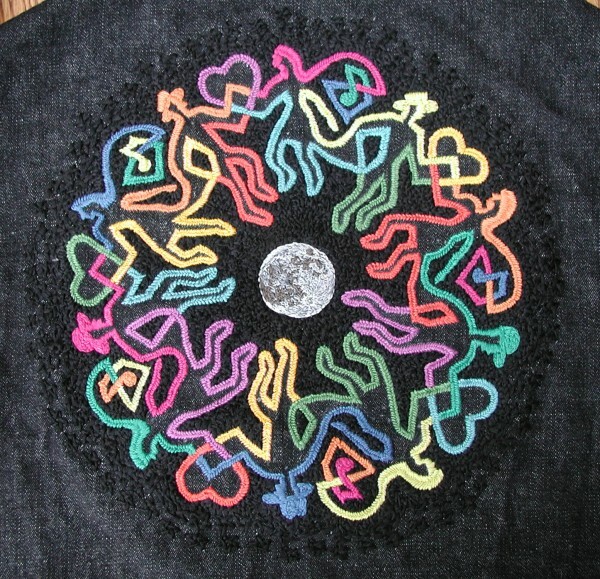 The moon in the center was inspired by the occasional midnight moonlight dances that are a magical part of the dance community tradition. It was embroidered directly onto the back panel of a jacket that she made for herself, and she requested that I also reproduce the moon on a button that could be worn on the front of the jacket, to which I gladly obliged. Dimensions: 9”x 9” = 81 sq. in.